To bring you all up to date, here is the latest information on the Springfield Armory joint event scheduled in the afternoon on Thursday, 03 August 2017 as both the Wichmann Open House and Generals House Reception worked out so well at the 2016 Sacramento National. The new event is in RED. 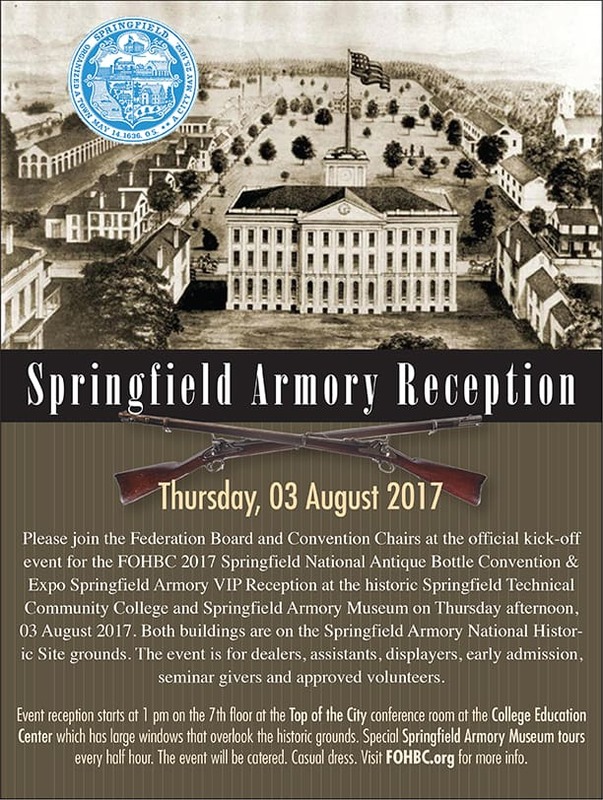 Added event to the FOHBC 2017 Springfield National Antique Bottle Convention & Expo. The FOHBC is working with the Events Coordinator at the Springfield Armory Museum and the Campus Events Coordinator at the adjacent Springfield Technical Community College. 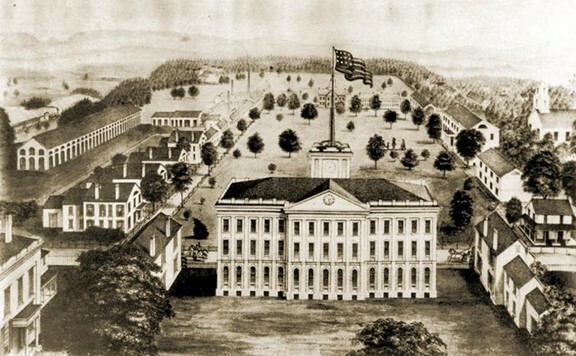 Both are in historic buildings on the National Historic Site (National Park Service) grounds and hold events. The FOHBC and Springfield Co-Chairs will be holding an afternoon reception on the 7th floor, “Top of the City” conference room at the Education Center which has large windows that overlook the historic grounds. 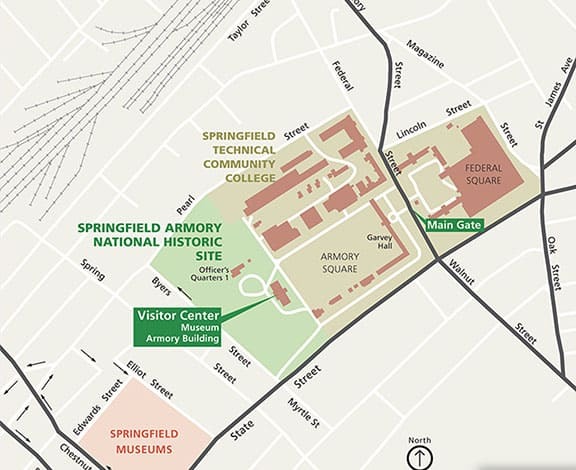 Address for Springfield Armory Reception: 1:00 pm to 5:00 pm at the Springfield Technical Community College, 1 Armory St, Springfield, MA 01105, College Education Building, 7th Floor (Top of the City Room). Springfield Armory Museum Tours would occur every 1/2 hour or so as the museum can only handle a max of 50 people in a group. The education center can hold 200. 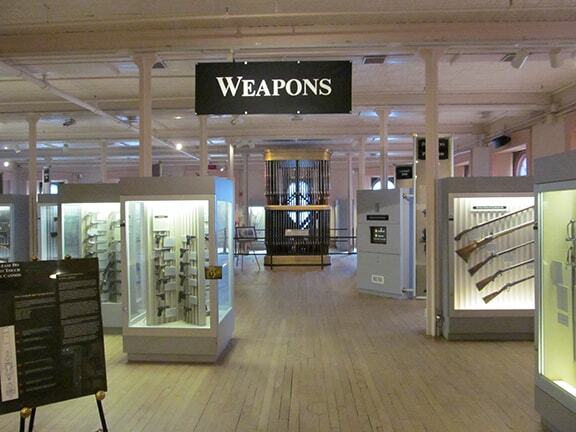 The tour would start with a movie in the Museum theater, followed by a tour of the Armory museum and grounds. The historic site is close to our venues too. For those without personal transportation, a 14 passenger shuttle will arrive at the Sheraton Monarch Place Hotel (hotel across the street from the Springfield Marriott) at 12:45 pm. The shuttle will pick up passengers and transport them to the Springfield Armory Museum. The shuttle will make continuous loops, with the last trip leaving at 5:15 pm from the museum. End of service 5:30 pm. The event will be catered with refreshments from Noon to 5:00 pm in the Top of the City conference room. VIP is defined as dealers, assistants, displayers, early admission, seminar givers and approved volunteers. Please add this to your agenda!